Home » Cheap and Good? 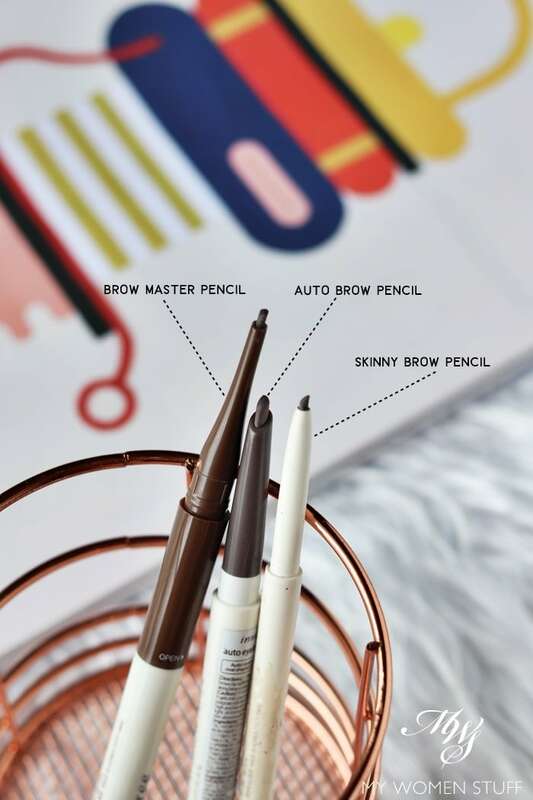 » Innisfree Auto Eyebrow, Brow Master and Skinny Brow pencils – Cheap as chips! 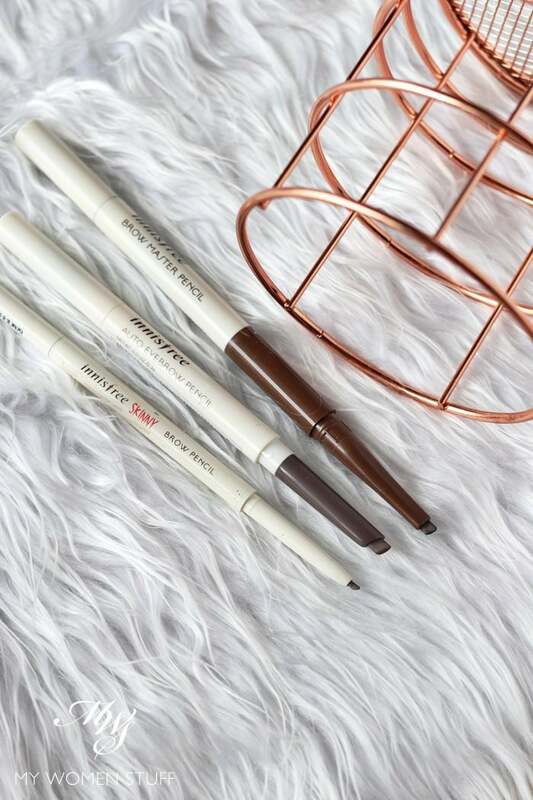 The Innisfree Brow Master Pencil is the one that looks like and functions like the Excel brow pencil. It comes in 3 parts – a pencil to draw and shape your brow, a spoolie brush to soften the look, and a sponge-tip brow powder applicator, to further fill in your brows. There are 4 shades available, with most of us going to opt for 04 Espresso Brown. This is the deepest shade available, with a grey base that is most flattering for our skin tones. The other shades pull too red. I used this for quite a while before I could make up my mind about it. I don’t deny that I tried very much to love it, so I wouldn’t have to dread the day I run out of my Excel brow pencil. But try as I might, I was not in love with it. The texture was just too waxy for my liking, and although I liked the flat pencil head it is not a favourite pencil. Still, I will use it because it isn’t bad. It just isn’t as good as one of the other two I’ll show you below. The pencil is too waxy so it does not adhere very well to the skin or hairs. It takes a few tries before you get the colour to apply nicely. This could be a good thing, as it helps novices make fewer mistakes, but I otherwise found it too trying eventually. I will still use it however. It’s not bad. It is too long and it’s hard to fit into a makeup pouch. While I was browsing the shelves at Innisfree, I saw the Skinny Brow Pencil, and it reminded me so much of the Dior pencil that I had to take it home to see how it fared! Well, it fares very well indeed! The Innisfree Skinny Brow Pencil comes in a few shades, but I picked it in 04 – Espresso Brown as well. It is the same grey-based brown that I prefer for my brows. 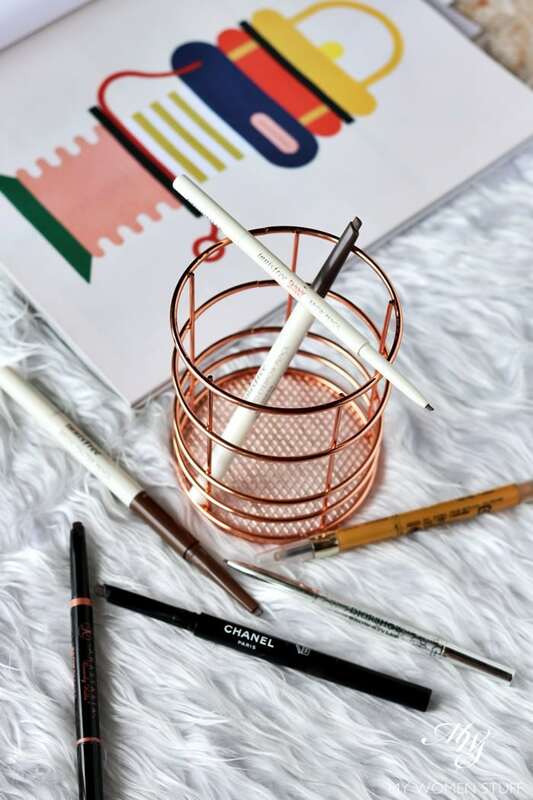 Because the pencil is so skinny, as the name implies, it allows you to be very very precise about your brow shape, and if you like to draw in the brow hairs very naturally. Last, and certainly not least, I picked up the Innisfree Auto Eyebrow Pencil purely for one reason – it was only RM14 (US$4)!!! WHAAATTT??!! Well, would you like to know that the Innisfree Auto Eyebrow Pencil is my favourite of the three? 😀 Oh yes it is! I surprised even myself! I picked it up in 04 Espresso Brown as well. In the tube, it has a rather more noticeable grey undertone, and this is true even on skin. I personally prefer that. It is also a more conventional width and length, with a slanted, triangular-shaped tip. I find that a more tapered, triangle shaped tip is easier to use, and draws a more defined shape while simultaneously filling in the brow. It reminds me of the shape of the Hourglass Arch Sculpting pencil. I find that the texture is soft, so it is easy to draw your brows in quite quickly. Importantly, I liked the soft spoolie brush. It is very similar to the texture of the Excel Brow Pencil, which at once softens your brow but does not remove too much colour. I don’t know why Innisfree could not use the same spoolie brush in all their pencils, because this is the best one! I thought you might like to see how the Innisfree Brow Pencils look next to each other. It is notable that the primary difference between each of the brow pencils is in the style of the nib. The Brow Master Pencil is flat and draws thinner, more precise lines. 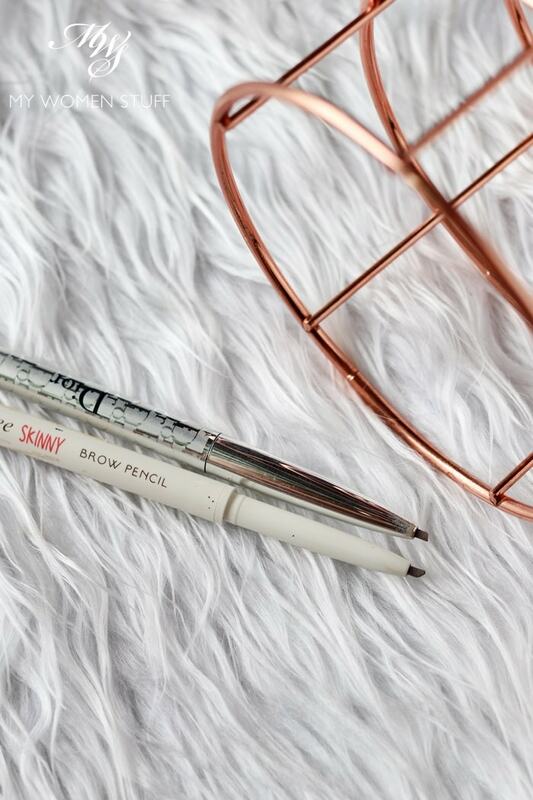 The Skinny Brow Pencil is round but with a very skinny nib that gives you a lot of control over the drawing of brows. The Auto Eyebrow Pencil has a broader, slightly triangular-oval shaped nib. This allows you to draw your brows in more quickly, with enough definition. Of the three, my favourite is the Auto Eyebrow Pencil (happily, also the cheapest! YAY! 😀 ) followed by the Skinny Brow Pencil and then the Brow Master Pencil. My gripe with the last is due to the more waxy formula as compared to its brethren. If it was not so waxy, I’d like it better too. 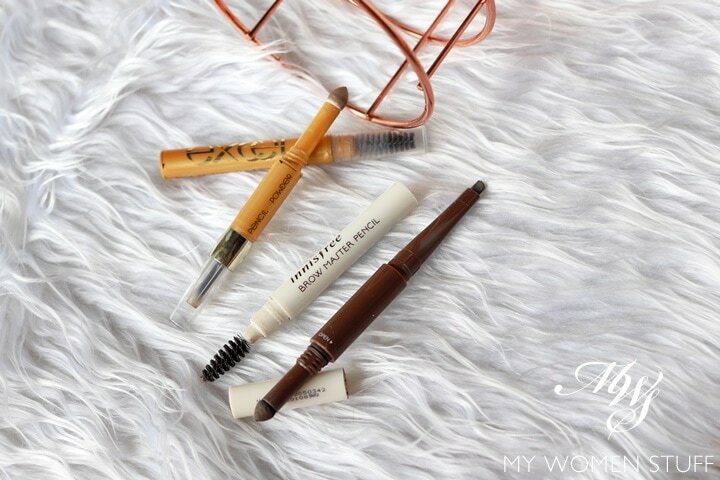 Have you tried any of these Innisfree Brow Pencils? NEXT POST: I love the Melano CC Intensive Anti-Spot Essence so much I almost did not want to tell you about it! About late last year I bought the innisfree Auto Eyebrow Pencil online because of the cheap price, so i thought why not? And it was such a great buy! The color, which is the same as yours, suits me perfectly and may i say, how easy it is to apply! I keep it for traveling purpose (i still have many other eyebrow pencil that i want to finish using before buying more of the innisfree one!) so i still have it. Hehe. Hi Qi Hua! 😀 Yay for enjoying the cheap and cheerful Innisfree Auto Eyebrow Pencil too! Goodness me, I was so surprised at how good it was. I mean, I’m not that great at drawing my brows but this is as good as, if not better than the fancy ones out there. Might as well save money! 😀 Oh and great idea to keep it for travel. Won’t feel heart-sick if it goes missing! thanks for the good recommendation ! definitely in my shopping basket. by the way, those skinny brow pencils typically only 0.08g, versus the blade sword like brow pencils be 0.3-0.4g. so price wise, a “cheap” drugstore skinny brow pencils may work out to be more pricey than luxury brands. example, the Innisfree skinny brow pencil (0.08g) / NYX microbrow pencil versus Hourglass arch brow pencil 0.4g so if you multiply by 5 times the price, it’s not that cheap after all ! Ooohhh yes! Glad you like it! Spot on about the Espresso Brown colour, how it is more grey then red and is just the perfect shade! I have all 3, with the skinny brow, a recent addition that I got from a complimentary mystery box. However, unlike you, my absolute favourite is the Brow Master. I just love the thin slanted tip cos I can be so much more precise. My brows are quite sparse so thin strokes with a precise angle works so much better at mimicking those small hairs and drawing precise line. I know what you mean by it being a bit more hard and waxy, however, I find that the slight slip on my skin from my skincare makes it glide on easier and thus just works so well for me. Anyhow, you can’t go wrong with any of these! After experiencing multiple breakages from using Anastasia Beverly Hills Brow Wiz & Brow Definer, I’m so done with that brand. So gonna get this! At this price, it won’t hurt to try. Just fyi, you turned me into a brow pencil hoarder. That’s the only makeup I put on everyday to work. Read your review about Hourglass Arch Brow Sculpting Pencil, got it and tried it, I love it! Oops! I assure you I didn’t intend to convert you LOL! 😀 Actually I am quite good about using up my brow pencils. They are the only makeup item I will use regardless of whether I have any other makeup on, so it does finish and I’m quite proud of that haha! The Hourglass one is so good! And the colour is just spot on. But do try these. Seriously, for the price, I cannot complain at all! Powder and gel brow products are the longest lasting! They never ever finish LOL! I have a pot of the Anastasia dip brow pomade and it’s still going strong after so long. But I find pencils the easier and quicker way to do my brows (with less chances of a Crayon Shin Chan brow LOL!) so I tend to stick to them even if they finish quickly. I do find the skinny pencil finishes the fastest. The regular sword shape/oval/triangle shape last longer. I have used the auto eyebrow pencil twice before.. Agree its very soft n easy to draw the brows but then I tend to overdraw them lol.. And it kinda makes the brows look/feel abit greasy when I perspire.. I might give the other 2 a try though.. Its still at an affordable price in sg. I’m currently using the missha eyebrow pencil which also comes with an angled auto pencil, powder n spoolie.. Good to use but abit pricier at above $20sgd..
Just grabbed 2 Auto Eye Brow pencils in Expresso Brown. Love the hardness and will try it tomorrow. I’ve been using Shu Uemura Hard Formula pencil for years and am loyal to brands. I will switch if this is equally good, my pocket will thank me. ?